This is the fourth part of a series of entries discussing various books that deeply influenced my writing and outlook on stories. You can read the Introduction here, Part 1 here, Part 2 here, and Part 3 here. Please note that discussion of these books may contain spoilers. The next round of influential books didn’t come until I entered college. Granted, I found lots of books that I loved between the age of 12 and 18, but truly influential books are much rarer. In my freshman year, I discovered anime and manga. Last Exile was the first anime I ever watched (I’m not counting random Pokemon episodes I saw when I was little), and reading manga soon followed. A six-year obsession with all things Japanese had begun. During that time, I read and watched so much anime that I needed a list to keep track of them all. Three series stick out in my mind from that time that remain favorites and powerful influences. 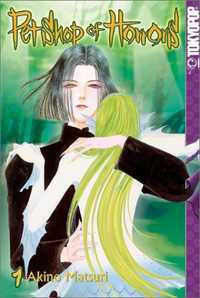 The first of these was Pet Shop of Horrors by Matsuri Akino. This 10-volume series is a horror manga, not my usual genre of choice. It’s both beautiful and eerie, revolving around a pet shop in Chinatown run by the enigmatic, androgynous, and amoral proprietor known only as “Count D.” Each volume contains about four stories of various people who come into the pet shop and leave with a pet…under certain conditions. Like in Gremlins, disobeying D’s instructions as to the care and feeding of their pets often results in calamity. Sometimes the pets are helpful to their new owners, but most of the time it ends in tragedy. Weaving through these tales alongside D is Leon Orcot, a detective who is sure that D has something to do with the various mysterious deaths throughout the city, but is unable to come up with any proof.